Choosing a shingle for your roof replacement project is a critical decision you need to consider before starting the project. It can be the difference between a successful project, and one that leaves you fuming every time it rains. If you invest wisely, you add to the value of your home and remain safe and secure during inclement weather. Mistakes in project planning can lead to skyrocketing costs. Even worse, that mistake might become a danger to the health and safety of your family. A single leak can lead to mold, creaks, damage in a storm, additional repair costs in the near term. Get the facts before you start a project. We’re going to take an honest look at some options. Along the way, we’ll eliminate the confusion and questions many homeowners have during planning. When we’re done, you’ll have a better idea of the pros and cons of shingle options and know what to expect as you investigate the market. The most common roofing shingle. Made of a fiberglass base between asphalt and ceramic granules. There’s a good reason it is so common among roofing contractors and homeowners alike – according to HomeAdvisor, they offer some of the best protection on the market at a very affordable price. There are two types of asphalt shingle. The laminated asphalt shingle, also known as architectural or dimensional, uses multiple layers to create a dimensional effect. The layering makes the asphalt shingle look like a more expensive material and creates an appealing effect of the light and shadow on the roof. It also provides durability, but it is heavier and can be slightly more expensive. The 3-tab asphalt shingle uses only a single layer of material, making it less expensive than the dimensional shingle. According to Consumer Reports, the 3-tab is thinner and lighter, but it doesn’t have the durability of the laminated shingles. As the price of shingles has dropped, more homeowners are turning to laminated shingles for durability and curb appeal at a lower cost. Composites are a combination of materials, such as clay, rubber, asphalt or plastic, depending on the brand and purpose of the shingle. Composite shingles can be made to look like a more expensive material like slate or wood. While the endurance of the material will depend on the composite, they offer the style and appearance of a more expensive material at a much lower cost. Typically, they offer more durability than similar asphalt shingle products and last longer before requiring replacement. At first glance, buying shingles can be overwhelming. With a little preparation, however, you can make the right decision for your home. Let’s look closely at some of the more popular products on the market. Please remember there is no set price for shingles. The price you pay can vary widely. The cost will depend on the retailers in your area and the time of year. These prices below don’t include the installation fees, which can dramatically change the cost of the roof repair or replacement project. Some shingles are easier to install and will lower the costs from your roofing contractor. Products in this tier are value-priced. This is not to say they won’t be the right choice for your home. There are products that offer style without breaking the bank. Many shingles in this tier offer a limited warranty and can be vulnerable to high winds and inclement weather. CertainTeed XT25: A starter product, the XT25 was once very popular. The shingles are value-priced ($70 -$85 per 100-square feet), but the single layer is less durable. For more durability, look at the CertainTeed XT30 and XT30IR, which offers impact resistance. GAF Natural Shadow: A starter, dimensional or architectural shingle, it offers a refined look and increased durability at an affordable price ($90 – $110 per 100-square feet). GAF Royal Sovereign: Another 3-tab starter shingle, the product offers stain resistance and a limited warranty ($60 -$80 per 100-square feet). Offering durability at a lower cost, most homeowners select standard shingles for a roof replacement or repair project. Owens Corning Oakridge: A 3-tab shingle that is thicker and more durable than other 3-tab shingles. The Oakridge is rated for higher wind resistance, utilizing a superior sealant, but might not be durable enough for stormy regions ($100 -$115 per 100-square feet). Owens Corning Duration: By using a special fabric on this laminate siding, the Duration offers additional protection during high-winds. All this comes at a slightly higher cost (around $115 – $130 per 100-square feet). CertainTeed Landmark Pro: A laminate shingle with two layers of roofing asphalt for additional durability. It also provides a richer, more vibrant color than other products. Comes in a range of colors at an affordable price (around $90 – $100 per 100-square feet). GAF Timberline HD: A very popular laminated shingle. According to GAF, they are the #1 selling shingle in America. The Timberline series offers an extensive range of colors at an affordable price (around $115 – $125 per 100-square feet). The top of the line, these products are for homeowners who want to make a statement with their roof. Owens Corning Duration Designer: The focus on these shingles is color and durability, providing a richer, more vibrant color palette. Many homeowners coordinate accents on the home and in the yard with the shingles (around $150 per 100-square feet). GAF Camelot: Provides the look of slate or wood shingles in an asphalt shingle and includes features for easier installation. Priced for the premium market (around $200 per 100-square feet). CertainTeed Independence: A very high-end shingle often designed to resemble a natural material such as slate, wood, or architectural shingles. Cost often depends on the contractor and installation (around $165 – $180 per 100-square feet). Using materials that reflect heat and solar energy, these shingles can lower air conditioning costs and are often Energy Star Rated. According to the Energy Star website, certified shingles can reduce air conditioning requirements by 10% – 15%. Owens Corning Premium Duration Cool: By using a reflective material, this shingle helps cool the roof and house. Includes a limited color range (around $200 per 100-square feet). GAF Timberline Cool: Energy Star-qualified roofing shingles use white granules below other colors. This provides the appearance of designer shingles while also reflecting solar energy to keep the house cool. Cost is typically 20% – 40% more than a product without the reflective material (around $135 – $170 per 100-square feet). CertainTeed Landmark Pro Solaris: Comes in a larger color palette and dimensional shingles that reflect sunlight to keep the house cool. Price can vary (around $150 – $180 per 100-square feet). Type: Many find the 3-tab shingles are easier to install, but most homeowners are turning to dimensional shingles for the durability and aesthetics. Appearance: Consider products that resemble natural and more expensive materials. A recent article discusses the CertainTeed Symphony shingles, made of composite material almost identical in appearance to slate, but is lighter and resistant to fading. Wind Resistance: Consider the weather in your area. If your home is prone to high winds, choose a shingle that offers more wind resistance. Lifespan: Less durable products will require more frequent replacement. Consider the lifespan when choosing a shingle. Algae Resistance: If you are concerned about discoloration on your roof, select a shingle that offers algae resistance to prevent blue-green and black streaks. Warranties: All shingles come with a warranty, but it’s important to read the fine print. Some warranties are unconditional, while others will only cover certain situations. Keep the warranty even after the work is done. 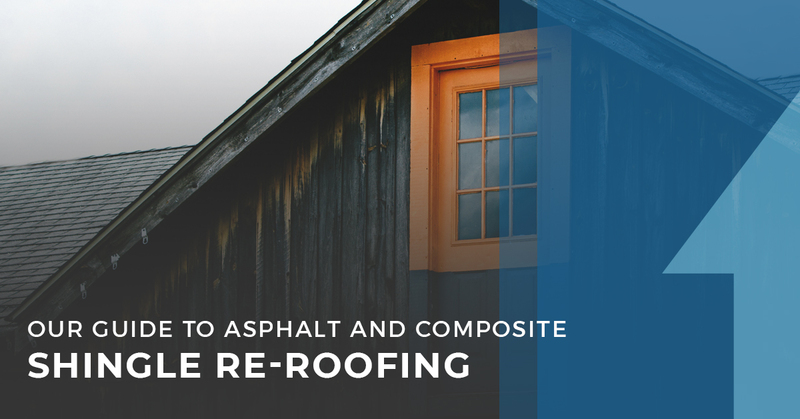 Now that you understand the market for asphalt and composite shingles, it’s time to start your project. We suggest contacting professionals in your area before starting any work or purchasing a shingle. Even for weekend warriors and do-it-yourselfers, a roof replacement or repair project is a major undertaking that can quickly spiral out of control without the resources and experience to manage the project. Contact us to discuss your project and review options for roof repair and replacement with a team of expert roofing contractors. We are happy to do work in Minneapolis and the surrounding area and we even offer additional services, including gutter, siding and window services.